Colorado has nearly 150,000 community college students, and CU Boulder wants more of them on its campus — especially if they like science. A newly formed team of CU Boulder experts and community college partners is trying to smooth the way between the state’s two-year colleges and its flagship four-year university, with an eye to creating opportunities for science and engineering (STEM) students and employers. The project, called Creating Academic Pathways in STEM, is among the first in the National Science Foundation’s INCLUDES initiative, which aims to diversify science and engineering in America. About 35 percent of all Colorado community college students are minorities. Many are also first-generation college students. Each year thousands of these students transfer to four-year universities, including CU Boulder. But the process can be daunting and needlessly complex, said Miller, who directs the Broadening Opportunity through Research and Diversity (BOLD) Center in CU Boulder’s engineering college, and co-investigator Noah Finkelstein, the CU physicist who directs the Center for STEM Learning. Simply translating community college credits to the appropriate university major can be confusing, she said. And many students who successfully transfer feel behind and overlooked, having had two fewer years to get to know professors and apply for the research and internship opportunities that can lead to jobs after graduation. Working off an initial $300,000 NSF grant, the Colorado team will have 18 months to streamline entry to CU Boulder for two-year college students and develop a series of unique programs for them. The team would then earn a shot at an additional $12.5 million for scaling the initiative statewide and beyond. 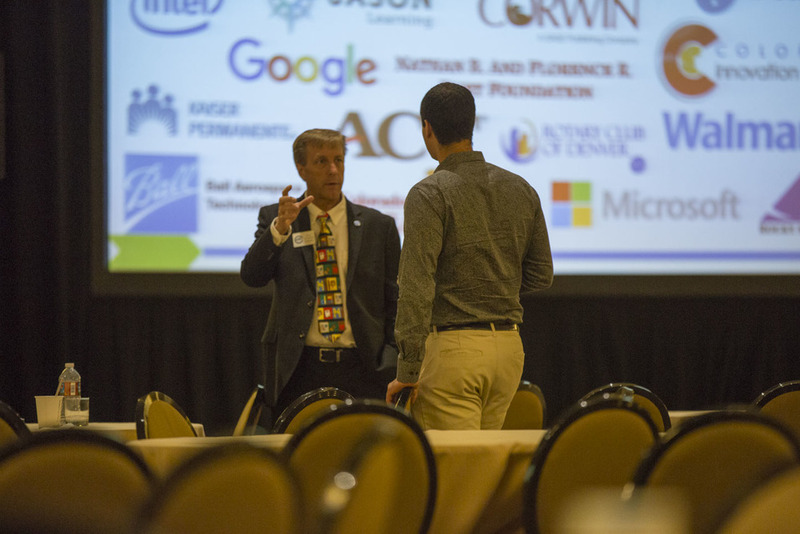 Early goals involve aligning curricula across two-year and four-year departments and developing internship programs with Colorado companies and national labs specifically for community college transfers. CU Boulder’s partners are the Community College of Denver, Red Rocks Community College, Front Range Community College, Arapahoe Community College and the Community College of Aurora. “Success is often more about supporting socio-cultural navigation rather than academic preparation for students transferring from community colleges to four-year colleges,” said Heidi Loshbaugh, dean of the Center for Math and Science at Community College of Denver. Loshbaugh, Anne-Barrie Hunter and Sean Shaheen of CU Boulder are co-investigators. The project’s full name is Creating Academic Pathways in STEM: A Model Ecosystem for Supporting 2-year Transfer. DENVER — The Colorado Workforce Development Council released on October 3, 2016 its annual Colorado Talent Pipeline Report to cap off Workforce Development Month. The report examines how well the partners of the Colorado talent development network – which includes education, training, workforce development, economic development and others – meet the needs of businesses and support the state’s economic growth. · What are current trends in Colorado’s talent pipeline, and how do those trends impact our current and future workforce? · What are the top jobs in Colorado that have high growth rates and offer a livable wage? · What skills are employers seeking? · What are the education and training strategies that the state and local partners have implemented, and how effective are those strategies? The report highlights jobs that have high growth opportunities and offer a living wage for a family of three. These jobs are concentrated in healthcare, information technology, business and finance, and engineering occupations. The vast majority of which typically require some formalized postsecondary training or education. The conclusion of the report provides recommendations from the Governor’s Workforce and Education Cabinet workgroup on how the state could strengthen its talent pipeline. · Promote apprenticeships by creating a strong foundation of youth apprenticeships that integrate secondary education, postsecondary education and work. · Support the cross-agency 2-Gen approach, and focus on “two-generation approaches” that work with both parents/caretakers and children to improve education and work outcomes. · Support streamlined regulations of credentialing to result in a more rapid response to filling high demand occupations. The Colorado Workforce Development Council produced the report in partnership with the Colorado Departments of Higher Education, Education, Labor and Employment, Human Services, Regulatory Affairs and the Office of Economic Development and International Trade, with support from the Office of State Planning and Budgeting, the State Demography Office at the Department of Local Affairs, the Department of Human Services, and the Department of Regulatory Affairs, along with other partners. The release of the report also marks the launch of TalentFOUND, the brand of the Colorado talent development network. Colorado is nationally recognized for its work aligning the efforts of its talent development network, including education, training, workforce, and economic development. Despite this, individuals and businesses are often unclear where to go for help with questions about job searches, talent recruitment or training options. The goal of TalentFOUND is to leverage the talent development network to help students, job seekers, workers, and businesses better understand and access tools and resources to create their own unique path to success. TalentFOUND is recruiting charter affiliates until the release of its full gateway landing page in spring 2017. The forthcoming electronic gateway will filter a database of assets via logic tree to best connect students, workers, job seekers, and businesses with the Colorado resources and tools already in existence that are most relevant to them. To learn more about TalentFOUND and what will be coming in the spring, visit: talentfound.org. It can be hard to know which colleges—and which majors—might be right for you and your goals. LaunchMyCareer, made possible with support from USA Funds, helps you cut through the confusion and find programs of study that can lead to well-paying jobs and a good life. This is a new webtool created especially for students and employers in Colorado. Launch My Career Colorado, launchmycareercolorado.org, is a project of U.S. Chamber of Commerce Foundation's Center for Education and Workforce; Gallup, Inc.; and the American Institutes of Research College Measures partnership. Colorado Association of Commerce and Industry (CACI) is leading the charge in Colorado. CACI hosted the launch event held June 9, 2016 at History Colorado. The webtool will cultivate more successful graduates through three main components: connecting to “hot jobs” as tailored to our state, emphasizing “hot skills” that companies around here want in its employees, and illustrating the return on investment (ROI) that can be expected in relation to the lives that users want, respectively. The system, which has components for students as well as currently-working adults, asks some specific and thought-provoking questions about lifestyle expectations and compares those expectations to career pathway projections. Colorado Business Roundtable is sharing the LaunchMyCareerColorado.org webtool with our member companies because we want you to have a strong, capable workforce, now and in the future. We are proud to be the recipient of a grant for this purpose from the U.S. Chamber of Commerce Foundation. Stay tuned for more from LaunchMyCareerColorado.org! If you know anyone who has used or should use this tool and would like to tell us about your experience in a sound byte or a whole podcast, please contact PR Coordinator Tara Alexander at 303-396-6210 or tara@cobrt.com. Visitors to COBRT.com, the website of the Colorado Business Roundtable (COBRT), may have noticed a recent addition to the pages. A full-width banner now highlights COBRT's newest sponsor, Colorado State University-Global Campus (CSU-Global). Although this is not the first time CSU-Global and COBRT have collaborated, it is the first time that the organizations have done so formally. Education and Workforce is one of COBRT's Key Issues within its scope of promoting a business-friendly region. CSU-Global is one of the three separate campuses in the Colorado State University System and the country’s first and only fully-accredited, public, non-profit, degree-granting university that is an entirely independent and 100% online school; not a virtual option supporting a bricks and mortar institution. The University is a premier provider of innovative, higher learning opportunities for nontraditional students in Colorado and beyond. Therefore, it is easy to see how working together to promote initiatives such as Skillful, for example, is a natural fit. 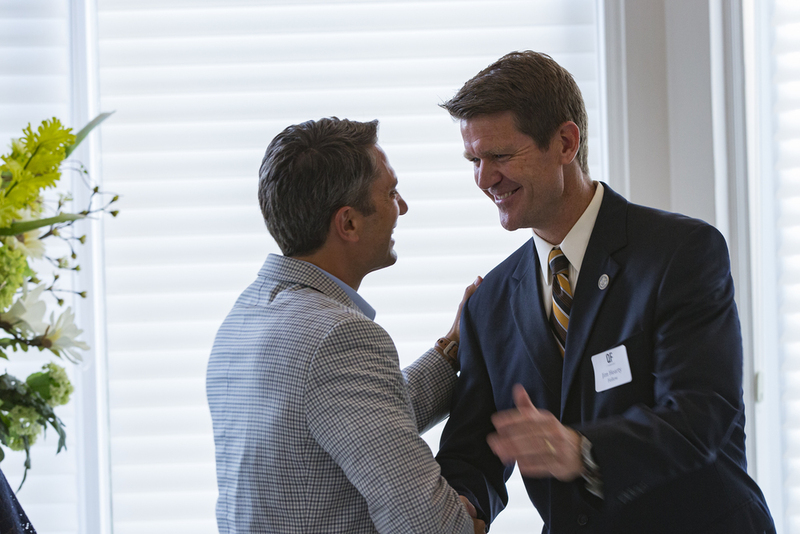 "Colorado State University-Global Campus is proud to partner with the Colorado Business Roundtable, in support of the business community and workplace success through education. As a leader in modern learning, CSU-Global continues to expand opportunities for companies and their employees to move industry forward through investment in higher education," said Dr. Becky Takeda-Tinker, president and CEO. This occasion also marks the first time that COBRT has offered a sponsorship opportunity through its digital media outlets and its partnership with ICOSA Media Services. ICOSA designed the banner and may provide additional designs in the future. If you are interested in furthering your education through undergraduate study, graduate study or professional certification, make sure to check out CSU-Global -- whether you are in Colorado or across the world. For senior executives seeking employee retention tools, the university also offers affiliate partnership opportunities that feature employee tuition discounts. And if you are interested in sponsoring COBRT's advocacy for a strong economy, please contact Jeff Wasden at 303-394-6097 or jwasden@cobrt.com. October 7 marks the fifth annual Manufacturing DaySM when thousands of manufacturers will again host students, teachers, parents, job seekers and community leaders at open houses, plant tours and educational sessions to showcase modern manufacturing technology and the cool jobs available. It is a chance for students to see the diverse career options that are innovative, impactful and durable. As the old idiom goes, “Seeing is believing,’ and that is the guiding principle behind Manufacturing Day. It was created in response to a dire need in America: The industry today faces a major shortage of skilled workers. An estimated two million manufacturing jobs will go unfilled over the next decade due to companies’ inability to find talent with the required skills. Several leading industry organizations determined five years ago the best way to combat this malady and reverse negative misperceptions people may have about manufacturing jobs and careers is to literally show “up close and personal” the exciting kind of work that takes place in plants across the U.S. Participation grows every year. In 2015, more than 2,600 live events were held attended by more than 225,000 students and 55,000 parents, educators, job seekers and other influentials. Impressive numbers, without a doubt. But, did “seeing” actually make these groups “believers”? “These findings significantly reinforce the value of Manufacturing Day,” according to Michelle Drew Rodriguez, manufacturing leader, Center for Industry Insights, at Deloitte. “For those truly exposed to modern day manufacturing, perceptions do change and, based on that, we will move the needle to better fill the skills gap that challenges so many companies today.” Drew Rodriguez explained that as a professional services firm, Deloitte talks to senior level executives every day and for them finding top talent is a top-of-mind, critical issue. It’s one reason why Deloitte has partnered with The Manufacturing Institute for a number of years to help tackle the problem. One of those joint initiatives is Deloitte’s Skills Gap studies. The current report highlights the impact of the skills gap and offers recommendations on how to help remedy it, which provides further credence to the benefits gained from Manufacturing Day programs. For example, 82 percent of executives responding to the Skills Gap survey indicate they believe the gap will impact their ability to meet customer demand. More than three-quarters (78 percent) believe it will impact their ability to implement new technologies and increase productivity. Large numbers also report the lack of skilled workers hurts the ability to provide effective customer service (cited by 69 percent) and decreases the ability to innovate and develop new products (62 percent). Yet, here’s the proverbial light at the end of the tunnel. According to the report, “Interestingly, those with high industry familiarity tend to have more favorable perceptions, and they are twice as likely (emphasis added) as those with no familiarity to encourage their children to pursue a manufacturing career.” This data aligns with a study done in collaboration with Skills USA, Educational Research of America, and The Manufacturing Institute, which found that 64 percent of students identified personal experiences as having the greatest influence over their career decisions. That statement captures the mission of Manufacturing Day. And, as the results of the survey of participants strongly demonstrate, changing perceptions through this initiative has become a tangible measurement. For students participating in Manufacturing Day, seeing really is believing – believing that their futures can be bright with a career in manufacturing. The Latino Leadership Institute is excited to announce that recruitment season has arrived for our next class of Fellows. Each cohort is designed to have a blend of industries, affording Fellows a profound opportunity to learn and expand their networks. Fellows receive executive-level training in personal and professional development, board service, corporate finance, economics, non-profit management, and public policy. The application process requires an online application with several short essay questions, one letter of recommendation, and a resume. A Selection Committee will then interview applicants in late November or early December. The application window will open on Saturday, Oct. 1, 2016 and close at 5 p.m. on Tuesday, Nov. 1, 2016. 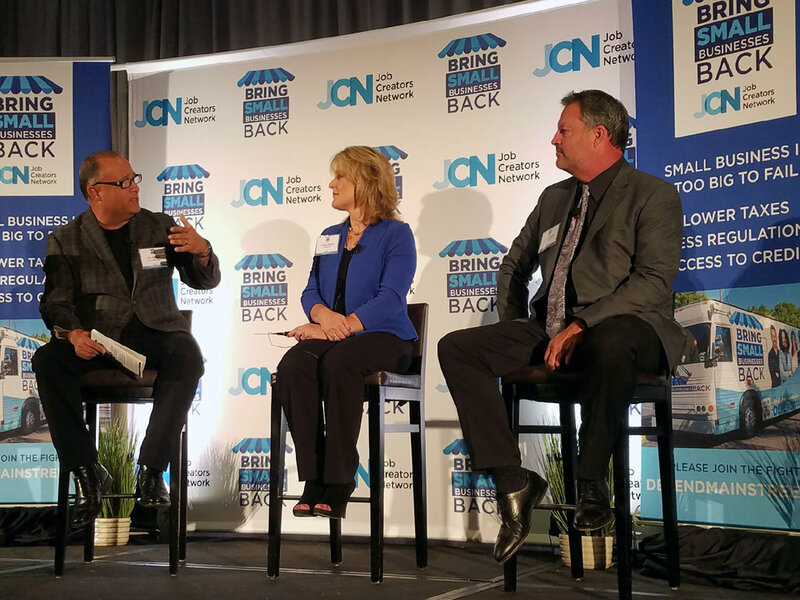 This week kicked off in a grand way, thanks to the Job Creators Network (JCN) and supporters of small business. 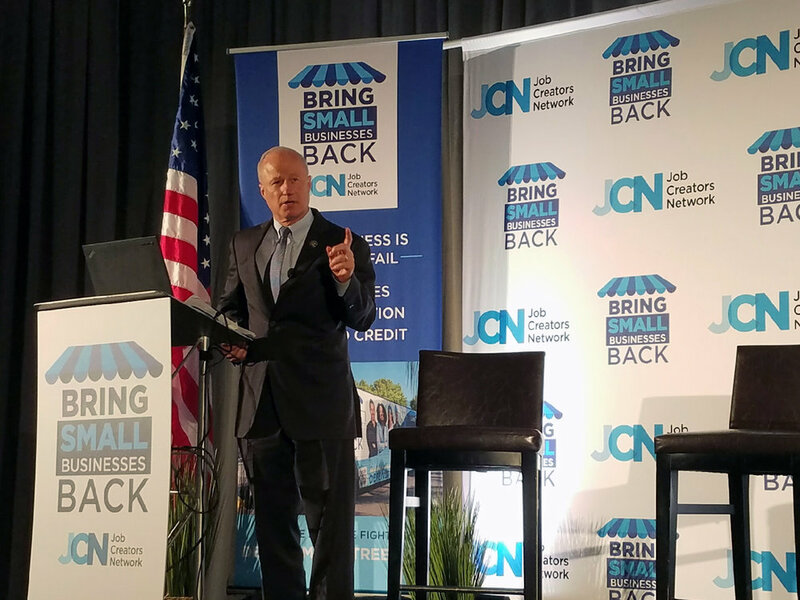 As part of the "Bring Small Businesses Back" nationwide tour, several Coloradoans including U.S. Rep. Mike Coffman and entrepreneur Heidi Ganahl joined JCN's Alfredo Ortiz and Elaine Parker in Denver on Monday, August 29, 2016 to raise awareness of small business challenges and opportunities. The multi-faceted Bring Small Businesses Back (#BSBB) program tackles three key areas that are hurting growth in the biggest section of the American economy: burdensome taxation, overregulation, and lack of access to capital is holding back job creation. To combat these problems on a national level, the BSBB is running an educational bus tour around the country and working with pro-growth legislators. The tour also connects citizens to state-specific issues. JCN notes, "These issues are of particular concern for Colorado because proposals for a single-payer healthcare system—funded by massive tax hikes on employers—and an increase in the minimum wage will be on the ballot in November." Elaine Parker, Chief Communications Officer of Job Creators Network introduced speaker Heidi Ganahl, Founder of Camp Bow Wow. Next, a panel of small business representatives discussed challenges of being an entrepreneur in the current regulatory environment. Salem Media's Lee Habeeb moderated the panel with Kristen Muzzy of Leading2Lean and Curt Henderson of Henderson Insurance Agency. Mike Coffman, U.S. Representative, 6th Congressional District of Colorado addressed the crowd next. The final speaker was Alfredo Ortiz, President and CEO of Job Creators Network. The event was held at the Hyatt Regency Denver Tech Center including time outside with the can't-miss #BSBB RV, pictured below. Learn more at www.DefendMainStreet.com, and check out this recent podcast about it all on COBRT's Connect and Collaborate radio. BOULDER, Colo., Aug. 25, 2016 /PRNewswire/ -- Lockheed Martin (NYSE: LMT) and the University of Colorado Boulder (CU) are establishing new academic programs through a multi-million-dollar agreement that will develop the next generation of space engineers. The Lockheed Martin Radio Frequency (RF) Space Systems Research Center will boost engineering expertise at the school and create new curriculum to fill in-demand skills in the space sector. The $3 million sponsorship by Lockheed Martin, spread over four years, will establish new academic programs focused on radio frequency (RF) systems. RF fields address commercial, civil and military needs for communications, radar and photonics. Engineers in this field will develop innovative approaches for tracking, navigation and control of spacecraft as well as next-generation global navigation technologies. "Each person depends on RF technology in one way or another, from television and radio, to phone communications, to GPS navigation," said Keoki Jackson, Lockheed Martin's chief technology officer. "As the complexity of our satellite systems and national security solutions grows, so does our demand for world-class talent. This partnership ensures that University of Colorado graduates have the skills they need to build the systems of the future while also advancing Lockheed Martin's ability to develop revolutionary and relevant innovation." "We greatly value our partnership with Lockheed Martin to propel our students, the aerospace industry and the state ofColorado to even greater heights," said CU Boulder Chancellor Philip DiStefano. "This partnership is particularly gratifying because of our long and productive relationship with one of the titans of the industry." A new master of science in electrical engineering with an RF focus. A new, established path for bachelor's degree students in Aerospace Engineering Sciences to obtain a master's degree in Electrical Engineering. Similarly, those pursuing an Electrical Engineering bachelor's degree will have a path to obtain a master's degree in Aerospace Engineering Sciences. A Lockheed Martin Chair of RF Engineering, a faculty position dedicated to RF teaching and research. A Lockheed Martin Faculty Fellow, a professor supporting research and academic activities of a key faculty member in the new educational programs. Lockheed Martin Graduate Fellowships, consisting of graduate students working at Lockheed Martin or projects relevant to the company. Students and graduates will be able to take advantage of the RF Payload Center of Excellence at Lockheed Martin's Waterton Canyon site, which is the company's hub for RF space technology development. Lockheed Martin employees will also benefit from the new relationship. For example, the new RF-focused degree programs will offer unique skills training for employees who want to take advantage of opportunities in the RF Payload Center of Excellence, which has added over 60 jobs in the past six months. The CU research center continues a strong partnership between the university and Lockheed Martin, a relationship that funds joint research programs, supports student design projects and facilitated a cubesat mission. Lockheed Martin has sponsored nearly $7 million in research at CU and is working to start new projects totaling $650,000 by the end of the year. In 2015 Lockheed Martin hired graduates from 15 CU majors, and the corporation employs more than 500 alumni working in its Space Systems division alone. The University of Colorado Boulder (CU Boulder) is the flagship university of the four-campus CU system. Founded in 1876, CU Boulder is a comprehensive research university with more than 30,000 undergraduate and graduate students. CU Boulder is the Rocky Mountain region's only AAU Tier-1 research university, and its world-renowned faculty maintain a reputation for excellence in research, creative work and teaching across 150 academic fields. Five CU Boulder faculty have received the Nobel Prize since 1989. Students who annotate digital textbooks could have the chance to use new software that can assess how they learn and suggest more effective study techniques, thanks to a project created at the University of Colorado Boulder, Rice University and the University of California San Diego (UCSD). Funded by a four-year, $1 million grant from the National Science Foundation (NSF), the effort will allow for the development of “smart” annotated online textbooks to gain a better understanding of a particular learner’s state of mind and grasp of subject matter. The study participants will use online textbooks provided by the nonprofit, open-source textbook publisher OpenStax that is based at Rice. The researchers also will create tools that use a student’s highlights to create customized quizzes and reviews for that student, said Mozer, a professor in CU Boulder’s Department of Computer Science and the Institute of Cognitive Science. “Highlighting is something students naturally do on their own, and we want to create software that can use those highlights to improve both their comprehension and knowledge retention,” said Phillip Grimaldi, a co-investigator on the project and research scientist at OpenStax. Mozer said the research team has adopted a “big-data” approach that involves collecting annotations from a group of learners to draw inferences about individual users. The project leaders will use the data to infer a student’s depth of understanding of facts and concepts, predict test performances and perform scholastic interventions that improve learning outcomes, he said. OpenStax uses philanthropic grants to produce high-quality, peer-reviewed textbooks that are free online and are used by roughly 680,000 college students at more than 2,000 colleges and universities. The team will be asking OpenStax student users to volunteer their digital textbook highlights for a database that can be mined for clues about their understanding of the text. Data from highlights supplied by OpenStax users will enable the research team to create tools that are sensitive to each student’s interests and highlighting choices, said Rice Professor Richard Baraniuk, a project co-investigator and the director of OpenStax. “The idea is to reformulate selected passages into review questions that encourage the active re-construction and elaboration of knowledge,” said Baraniuk. The research team also includes co-principal investigator Professor Hal Pashler, who will lead the activities at UCSD. Colorado Succeeds is thrilled to announce the launch of the Colorado Readiness Report, an interactive and easy-to-understand dashboard of key performance indicators for Colorado’s education system. The Readiness Report cuts through the clutter to focus on the 12 most important predictors of student success, from kindergarten through career entry. At Colorado Succeeds, we believe in using data to identify best practices, scale successful innovations, and ensure that our state’s limited resources are invested wisely. The Readiness Report puts this information right at our fingertips and helps business, education, and government leaders focus on continuously improving our education system. I encourage you to peruse the dashboard, share it with your networks, and use it as your go-to resource for education and workforce information: http://www.coloradosucceeds.org/readiness-report/. And I welcome your thoughts, questions, and feedback on the dashboard. Thank you for your continued partnership. Ron arrived for his last day of work as usual, before anyone else was in the office. He tried to ignore the knot in his stomach as he turned on his computer and prepared for his first conference call of the day. Ron had risen through the ranks of his international consumer products company, stayed current in his field, become a manager, and participated in many projects that had been very profitable for the company. It made Ron physically ill to think about this being his last day at work. True, he was past retirement age and was fully vested in his retirement program. True, he was no longer striving for promotions. Yet he still had plenty to offer. Unfortunately, the company didn’t see it that way. Ron wanted to keep working, but dial back his hours. But the company’s philosophy was ‘‘all or nothing’’ — you are either fully engaged or you are not employed here. The truth was, Ron was being pushed out and he didn’t like it. ‘‘I’ll show them,’’ he thought to himself. ‘‘I’ll take my knowhow and my business relationships with me tonight when I leave. To heck with them.’’ Yet no matter how much indignation Ron tried to muster, he still had that knot in his stomach. He didn’t want to leave. We all know a “Ron.” The 78 million Baby Boomers born between 1946 and 1964 in the U.S. have challenged us as a society for over sixty years. We built new schools to educate them, new suburbs to house them, and new industries and jobs to challenge them. Women’s widespread entry into professional positions is a Baby Boomer phenomenon, as are 401(k) retirement accounts, credit card debt, dissolution of the nuclear family, and increasing reliance on science and technology for a better and longer life. Baby Boomers in the U.S. are currently between the ages of 47 and 65. The sheer size of the generation is going to place tremendous strains on Social Security and Medicare, and the reliability of 401(k) accounts for retirement is questionable, at best. In addition, with life expectancies in the 80s, it is unreasonable to assume that any pension plan could affordably support this large population for 20-30 years of retirement. Finally, Boomers are not very good savers. They cannot afford to retire. Baby Boomers have changed many things about life in the U.S. since their births, and they are not finished. According to the Bureau of Labor Statistics, about 10 percent of the labor force was age 55 or older in 2000. By 2015, 20 percent will be 55 or older. And a recent survey by the Transamerica Center for Retirement Studies found that 39 percent of respondents plan to retire after age 70 or not at all. How do we productively engage the aging workforce in work now, and how do we craft careers for younger employees that will serve them well through all stages of their adult lives? Contrary to common beliefs, older employees are not stubborn, rigid, low performing liabilities. Numerous researchers find older workers to be more engaged, more loyal, less likely to quit, less likely to be absent voluntarily, more willing to work hard, and just as adaptable when given the opportunity, compared to their younger colleagues. This is especially true for jobs in which the physical requirements of work are not a limiting factor. Older employees are better qualified, more interested in accomplishment, more interested in doing meaningful work, more motivated by autonomy and flexibility and less interested in promotions than their younger co-workers. Older employees hunger for an opportunity to make a difference, to bring their years of experience to bear and help others. They want to make a contribution and be respected for their wisdom and expertise. Sustainability implies preserving and enhancing human capital rather than depleting it. It implies restoring and maintaining balance. To be sustainable throughout life, careers must have three features. They must include renewal opportunities, times when employees paus briefly to reinvigorate themselves. They must be flexible and adaptable. Half of what we think we know now will be obsolete in a few years. Individuals and firms need to be continuous and flexible learners, ready to travel new roads as conditions dictate. Finally, sustainable careers must include opportunities for integration across life spheres and experiences that lead to wholeness, completeness, and meaning. Let’s look at each of these in more depth. Renewability implies replenishment in a reasonable amount of time. It implies the ability refresh, to extend, and to be available indefinitely. The renewability feature of careers prevents burnout, akin to allowing time for muscles to recover after a rigorous workout. Renewable career practices provide periods of time for consolidation, reflection, rethinking and retooling. The case of Nancy Tuor of CH2MHill is an example. Nancy was the project executive for CH2MHill charged with cleaning up a highly complex hazardous waste site that was littered with radioactive waste. She and her team completed the estimated 60-year job in less than 10 years at a cost of one-fifth the original estimate. The project was a quintessential high visibility, high stakes, fast moving and extremely successful experience in her career. After completing the project, her career trajectory took her to a less visible, less turbulent assignment as vice-chair in which she developed future revenue streams through project proposals. She was not stagnated or plateaued, as might happen in another firm. She was investing in the future. After her time as vice-chair she went back into another high visibility job as the company’s project executive for building a carbon neutral city in the Middle East. Nancy’s story is not unique in engineering firms, yet it is also not common. Too often we move ourselves (or our employees) rapidly from place to place, assignment to assignment. A lull in the action is an indication of a problem, not an opportunity. Not so at CH2MHILL. While the firm certainly keeps its billable hours at a reasonable level, it also has a practice of asking people to contribute from time to time in a different, less turbulent, less visible role, as Nancy did. The company benefits, as do its employees. Flexibility means being easily shaped and reshaped, adaptable, agile and capable of change. Flexibility implies range of movement, elasticity, and the ability to bend without breaking. Flexibility produces resiliency and confidence, two key components of positive psychology. Careers of the future must be flexible and adaptable, characterized by continuous learning both in response to change and in anticipation of change. We know things will not be the same next year as they were previously, but we do not know how they will be different. At Intel and many other technology-based companies, the majority of profits in any one year are from products that did not exist two years previously. Continuous learning is akin to tennis players always keeping their feet moving. The best players may not know where the ball will be, but being in motion helps them get to the ball more quickly. Daniel started his career in the financial services industry, working in operations – the backroom activities that keep the system working. It was not a job that led to trading or investment banking or wealth management, yet these were the types of jobs Daniel wanted. He continued his education, learned the fundamentals of investing, and achieved professional certifications necessary for advancement in investment analysis and wealth management. He made himself available for task forces and special projects that gave him visibility among investment professionals; he learned everything he could about the business on the job; and he found a mentor who straddles his world (operations) and the other functions in the firm to which Daniel aspired. After several years in operations, Daniel was asked to lead a project team that gave him great visibility among investment associates. When the project was completed, he was asked to manage the new activity – located in the investment management part of the firm. He is now a managing director in a prestigious investment bank. Daniels’s case illustrates on person’s tenacity and flexibility. Even better are examples of employers who have flexible, on-demand talent management strategies so that many “Daniels” can develop simultaneously. These firms are likely to be young and doing business in rapidly changing fields, firms such as Google, Zappos, and Apple. Their flexibility and adaptability are part of the reason for their success- being able to deploy the right talent at the right time on the right task. And these firms attract talent that is excited about flexibility and not worried about a lack of fixed career paths. Older adults have perspective, see connections and draw conclusions from the disparate bits of information more readily than younger adults. They see patterns and networks younger workers often do not see. Imagine engaging experiences employees as one company did. Sam, a long time employee at a mid-sized international engineering firm, had become marginally productive and difficult to work with. He was isolated at work, both physically and interpersonally. At 65 years old, he was as sharp as ever mentally, showed no signs of wanting to retire, but had lost his ability and willingness to work effectively with others. As a result, he was given tasks that reinforced his isolation and that were not at the cutting edge of the business. His new supervisor, Tony, realized that Sam’s talents were wasted in his current job. Taking advantage of Sam’s years of experience and solid customer relationships, Tony created a Customer Quality Assurance role for Sam, representing projects holistically to the customer rather than contributing as one of the project engineers. Because of his years of experience, Sam is able to evaluate project quality and integration as a whole and able to be the go-between with customers. Tony also moved Sam to the front of the office area in a prominent and visible space. He paid attention to him. He honored Sam’s experience. He supported Sam’s job activities. Sam completely turned around his performance. Where previously Sam was a troubled, even dysfunctional employee, he is now highly valued and respected by his peers and contributing to his company’s bottom line. This is an example of adding integration opportunities to talent management practices. Not everyone can be a “Sam,” but how many “Sams” are pushed prematurely out the door with a gold watch, or relegated to trivial work at the margin of the company? Sustainable careers engage the “Sams” of the world in ways that are appropriate to their stage in life, building on and using their need for integration. The aging Baby Boomer Generation presents an opportunity to reinvent personal and organization career strategies. For 40 years, society has made only incremental changes around the edges of traditional career practices in response to more women in the workplace, advances in information technology, and the rise of knowledge-based work. Vestiges of old assumptions remain – employment policies that punish or prohibit flexible work; promotion patterns that punish child-bearing and child-rearing; job descriptions that require face-to- face work when not necessary; and retirement plans that push people out the door based on age rather than engagement and value. The time for change is long overdue. As has happened so often in the last 40 years, it may be the large Baby Boomer Generation that triggers significant and lasting change in the way society engages people in work throughout life. Sustainable careers can help companies in at least five ways. Knowledge retention and knowledge transfer, huge issues now for companies, can be enhanced with continued engagement of more experienced people who have stayed current, who have not burned out, and who possess unique knowledge. As work in the U.S. becomes more knowledge-based, the need to manage knowledge will increase. South Metro Denver Chamber's Women in Business are excited to announce that they will be honoring four women at this year's conference: a "Next Wave" Leader, an "Outstanding Philanthropic" Leader, a "Champion of Change" Leader and a "Legacy of Leadership" Leader. They invite you to send in your nominations of outstanding female business leaders for these four awards from within the Chamber Community and the greater South Metro Denver Region. Award applications are due by Tuesday, August 9. Final Selections will be made by the Award Selection Committee by Friday, August 19. 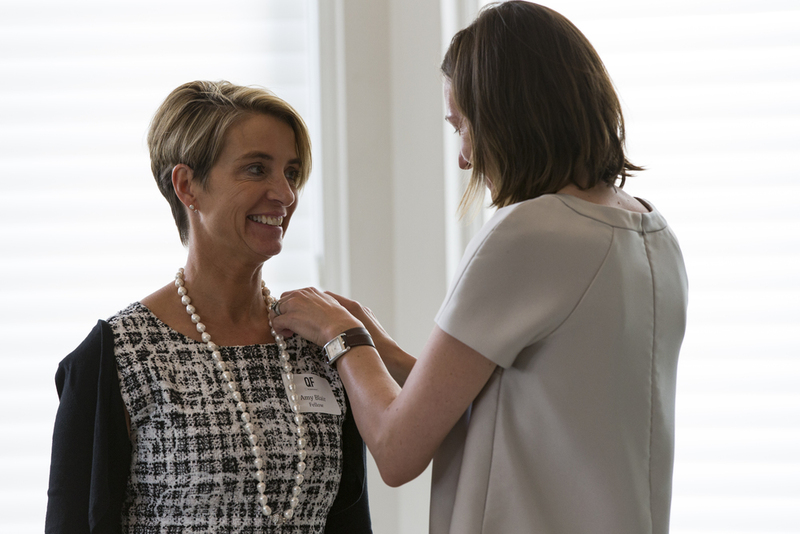 The South Metro Denver Chamber's Annual Women in Business Conference connects professional women and entrepreneurs to distinguished speakers and community leaders around some of the most important issues facing business leaders today. Join nearly 300 attendees as we dive into topics like Real Communication, Mental Toughness, Leadership Development and more throughout this engaging full-day event. For more information about sponsorship opportunities, click here. The call to public service comes in several forms. Some people seem to be born leaders, the kids who declare in kindergarten that they want to be president. Some find it through a passion for community service or political issue that elevates to a leadership level. Others might not see themselves as potential officials until a mentor gives encouragement. 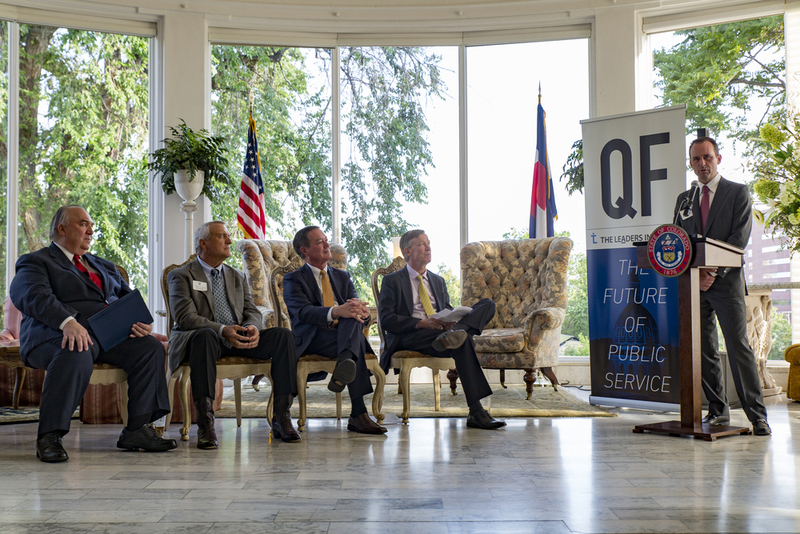 Quarterly Forum (QF) and The Leaders Initiative (TLI) have joined forces to ensure that Colorado cultivates top candidates to serve in public sector leadership roles with the Colorado Governors Fellowship Program. 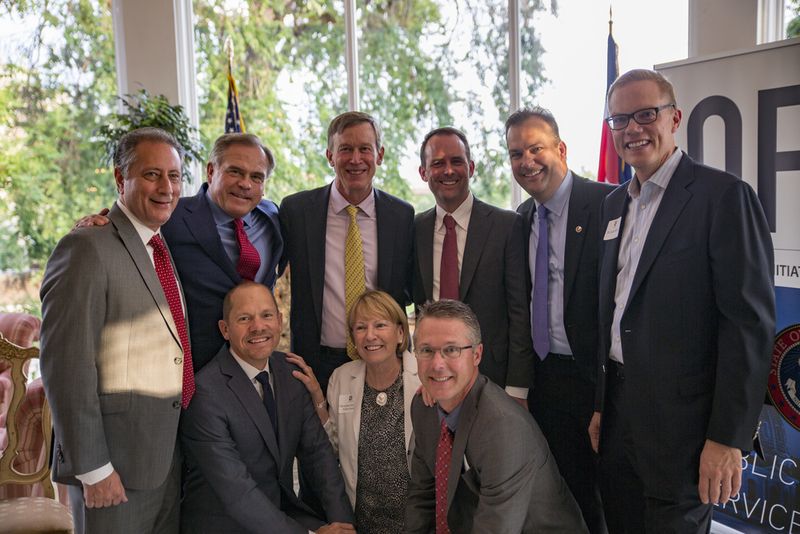 The program kicked off with enthusiasm at the Governor’s Mansion on June 29, 2016, and Colorado Business Roundtable was pleased to be a sponsor. It presented us with an excellent opportunity to bring Business Roundtable CEO and former governor of Michigan John Engler back to our state to serve as a guest speaker. Two Business Roundtable Executive Committee members were in attendance: John A. Hayes, Chairman, President and Chief Executive Officer of Boulder's Ball Corporation; and Jacqueline Hinman, Chairman and Chief Executive Officer of CH2M, headquartered in Englewood, CO. Business Roundtable member R.A.Walker, Chairman, President and Chief Executive Officer of Anadarko Petroleum Corporation flew in from Houston, and Colorado President Roberta Robinette represented for AT&T, another member of Business Roundtable. Dr. Geoff Smart, Chairman & Founder of ghSMART & Company, Inc. and author of the book Leadocracy was also a guest speaker. Colorado Governor John Hickenlooper, QF President Meegan Moszynski, and QF co-chairmen Erik Mitisek and Ryan Heckman also gave remarks. Other featured attendees were Former Colorado Governors Bill Owens and Bill Ritter. Colorado Governors Fellowship Program works across all sectors including government and non-profit, but it has a specific lean toward identifying potential public servants currently working in private industry. The inaugural fellowship has 22 of the state’s best and brightest from a variety of top companies such as Anadarko Petroluem Corporation, Arrow Electronics, Inc. and DaVita Healthcare Partners, Inc. For a complete list, see here. Gov. Engler posed a challenge to the new Fellows to make this program so renowned that it would become a model for others states and for Washington, D.C. He commended the work of the CH2M Foundation promoting science, technology, engineering and math (STEM) education. In the vein of Colorado’s commitment to education and workforce, Engler posed an even greater challenge: achieve reading proficiency by third grade for all students. He mentioned that only about one-third of students in the United States meet that level of proficiency, and he is still looking for the state which can change it. While meeting that specific challenge is not necessarily the goal of this inaugural class of Colorado Governors Fellows, it is clear that these are the people, the groups, the mentors and the experiences to make major progress even more achievable. Best wishes to the 2016-2017 Colorado Governors Fellowship! We can hardly wait to see what you make of it. 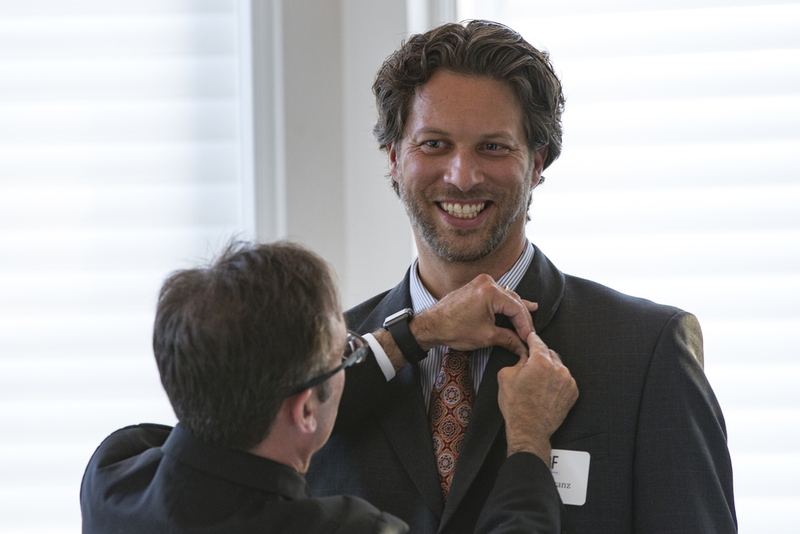 It was an evening of conversations and connecting as more than 350 Executive MBA graduates gathered at the program’s first reunion June 25 at the History ColoradoCenter. Members from 66 of the 67 cohorts were represented at the event. The Daniels Executive MBA program was initiated in 1973 and was one of the first EMBA programs in the United States. Tia Furcht (Executive MBA 2015) flew in from Las Vegas to attend the reunion. The attendees mingled, enjoying food, drink and music before the program. 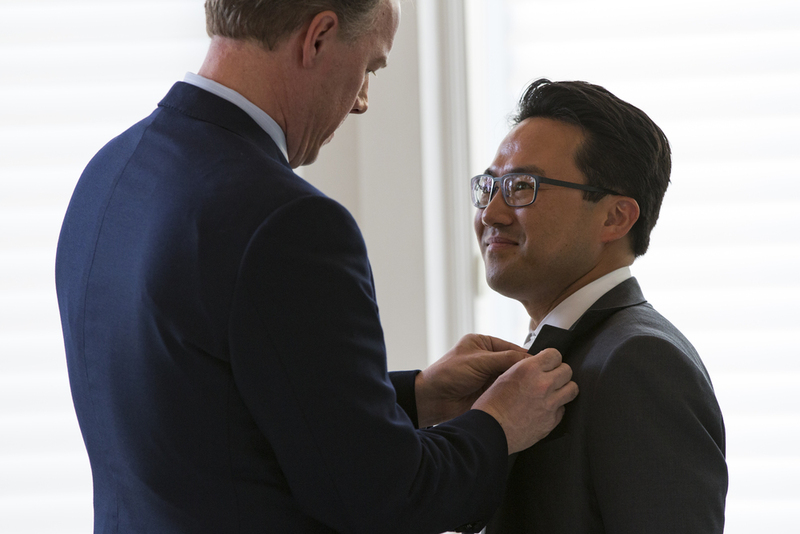 In attendance were doctors, business and community leaders, entrepreneurs, lawyers and educators, all of whom graduated from the Daniels EMBA program. Dean Emeritus Bruce Hutton and Associate Dean Barb Kreisman reminded attendees about the Daniels College of Business’ namesake—cable industry founder Bill Daniels—who introduced ethics in business education to the College with a gift of $11 million in 1999. Daniels Dean Brent Chrite also presented Kreisman with an award for her years of service to Daniels and the EMBA program. The audience gave Kreisman a standing ovation, as they did for many of the award recipients. 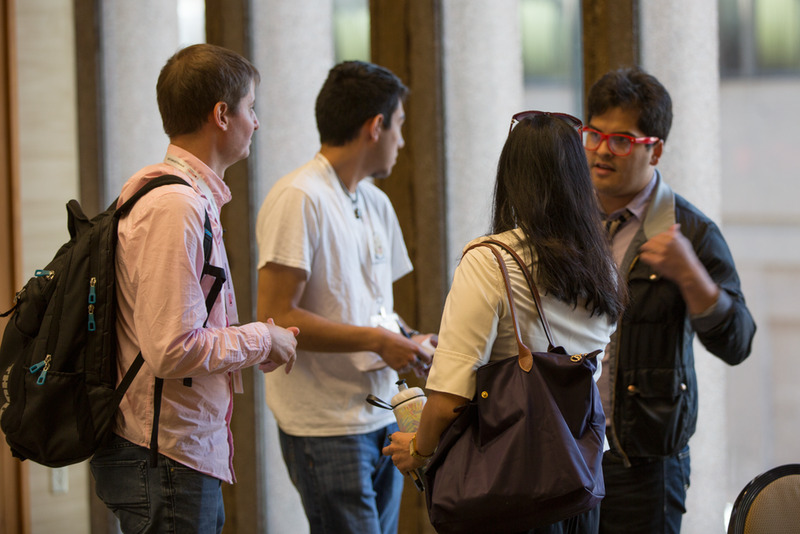 Following the program, attendees continued to connect with their fellow graduates. Remember when political and social activists targeted CEOs and their companies for various alleged sins? Nowadays, it’s big business and big-name executives carrying the protest signs. Top corporate executives, such as Apple’s Tim Cook, PayPal’s Dan Schulman and Salesforce’s Marc Benioff, among others, have admonished politicians, and, in some cases, threatened economic reprisals against several Southern and Midwest states because of legislative action on hot-button social issues. CEOs are using their wealth as well as the bully pulpit, too. For instance, not long ago, Facebook Chief Executive Mark Zuckerberg donated $100 million to Newark, N.J., school system; EBay founder Pierre Omidyar has used his wealth to back public interest journalism; and PayPal co-creator Peter Thiel, in the recent Gawker case, has spent some of his billions, controversially, to fight salaciousness-seeking journalists who invade the privacy of public figures. Regardless of what you think of these issues, it shouldn’t surprise us that a CEO’s voice can lead to major changes in a state or nationally. CEOs have the ability to direct conversation and wield significant influence. At their best, they are leaders who think strategically, can persuade through direct discussion, networking, and exert political influence. And certainly enough needy causes exist for their concern, everything from cancer cures to gay rights. But doesn’t one area in particular – education – have the biggest direct impact on businesses? What would happen if we replicated the CEO activism we are seeing on social issues and injected it into the issue of educational equity? After all, it’s been over 62 years since Brown v Board of Education, and our country is still facing pernicious achievement gaps and a majority of students leave high school ill-equipped for higher education or the workforce. I recently spoke with Zack Neumeyer, chairman of Sage Hospitality in Denver, which he co-founded and served as the chief executive officer of for nearly 20 years. Sage is one of the nation’s largest hotel companies with over 7000 employees in 35 states. He is an advocate for both CEO activism and school reform. Neumeyer believes the time is ripe to speak loudly and boldly, which he often does. This piece originally appeared in Fox Business. To read the entire piece, click here. It's posted at the Colorado Succeeds blog. Colorado Business Roundtable and ICOSA Media were pleased to be part of the GlobalMindED conference on Access, Equity and Opportunity as panelists and media service sponsors, respectively. 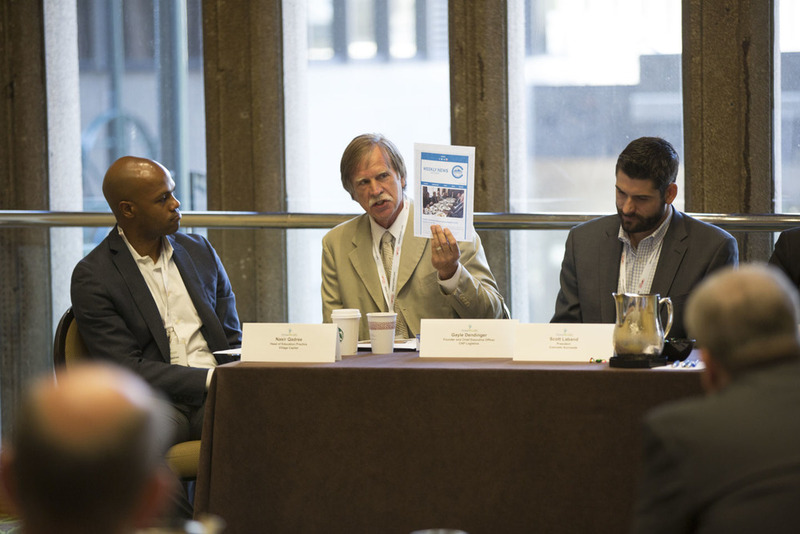 The event was held on June 9-10, 2016 in downtown Denver. Educational leaders from 20+countries, eight national foundations, ten college presidents, and thirty five non-profit/government partners were featured. 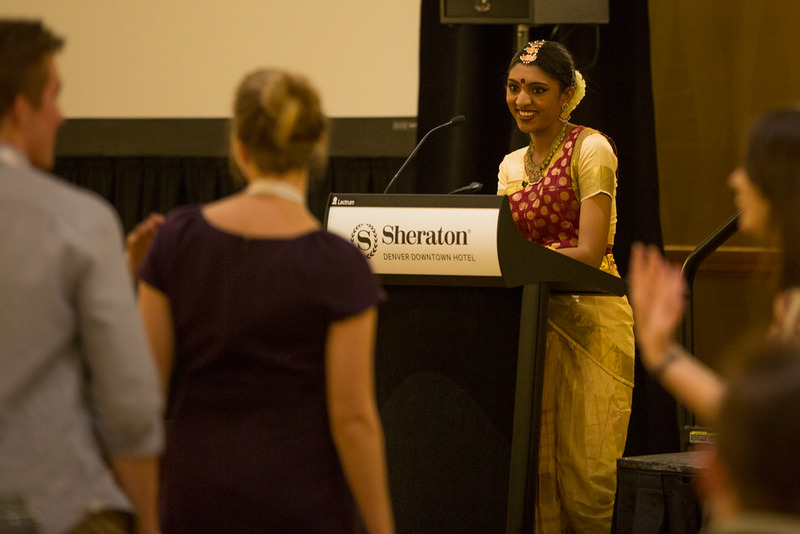 The theme of the conference was Collective Impact: Who Will Magnify Your Work and Results? Featured speakers were from industry-leading companies including Intel Corporation, Google, Microsoft and Gallup as well is innovators like Uncharted Play and University Ventures and educational organizations like Institute for Global and Online Education in the College of Education at University of Oregon and American Indian College Fund. COBRT Founder Gayle Dendinger was a panelist for "Policies that Promote Innovation and Entrepreneurship: Examples from Colorado that Can Scale Nationally, Internationally" on June 10. Speaking on this topic is a natural fit for Dendinger whose work in leadership and best practices has led to several companies starting with transportation and logistics (CAP Logistics in Denver 34 years ago) to media services including a radio show and weekly news subscription service. COBRT President Jeff Wasden was a panelist at "Higher Education's Role in Promoting Workforce Skills: Producing Capable, Practical, Professional Graduates" on June 9, continuing to speak on behalf of Education and Workforce as one of COBRT's Key Issues. COBRT radio host Stephanie Veck of Colorado Workforce Development Council and COBRT contributor Scott Laband of Colorado Succeeds were also among the distinguished speakers. Coloradans are pioneers at heart. Some of us not only grew up here but have families who were among its early settlers. It is no surprise then but always still a coup when our state achieves a number one ranking or is selected to pilot a program. Being the first state in the nation to utilize a unique career pathway tool is not only a testament to our current robust education and business climate but also to our commitment to future generations. Launch My Career Colorado will help students, working adults and businesses connect in novel ways for a sustainably-thriving workforce and economy. Carol D'Amico, Executive Vice President of National Engagement & Philanthropy, USA Funds, made opening remarks about helping consumers make good decisions about investment in higher education. Keith Pearson, Chair-Elect on CACI’s Board of Directors & President of McLane Western, discussed the demonstration of value from said investment in higher education in its variety of formats from a traditional Bachelor’s degree to an Associate’s degree to certificates and industry certifications. Colorado Governor John Hickenlooper then took to the podium and noted how this tool aligns the wide variety of interests represented among the crowd of more than 125, from businesses to policy advocacy organizations to education administrators to workforce development specialists. This kind of alignment across the board focusing on a strong workforce can get Colorado through the turbulence that other states may face. Furthermore, the Launch My Career Colorado webtool itself will reveal to its users the economic reality of our decisions over the course of entire careers. The webtool’s lead researcher, Mark Schneider, President of College Measures division of American Institutes of Research, then gave an overview of the tool and how it will cultivate more successful graduates through three main components: connecting to “hot jobs” as tailored to our state, emphasizing “hot skills” that companies around here want in its employees, and illustrating the return on investment (ROI) that can be expected in relation to the lives that users want, respectively. The system, which has components for students as well as currently-working adults, asks some specific and thought-provoking questions about lifestyle expectations and compares those expectations to career pathway projections. Schneider will speak about the tool in depth on Connect and Collaborate Radio at 1690 AM on Tuesday, June 14, 2016 from 4-5 p.m. There was then a roundtable discussion moderated by Brandon Busteed, Executive Director, Education & Workforce Development, Gallup, Inc. Participants on the roundtable included Scott Laband, President, Colorado Succeeds; Matthew Gianneschi, Chief Operating Officer and Chief of Staff, Colorado Mountain College; Ray Johnson, Citizenship & Corporate Affairs Manager, IBM; and Jennifer Sobanet, Acting Executive Director and Chief Operating Officer, Colorado Department of Higher Education. Robin Wise, President and CEO of Junior Achievement-Rocky Mountain, Inc., concluded the webtool launch luncheon by sharing powerful stories of some of their 136,000 students who have already tried Launch My Career Colorado. It provides inspiration and “practical hope” so that students and their families can make the most advantageous investments in higher education. Colorado Springs Regional Business Alliance and Colorado Business Roundtable (COBRT) applied for and were chosen as grant recipients to ensure that our members and more utilize this valuable tool. COBRT is invested in education and workforce development as a Key Issue in our commitment to a business-friendly Colorado. Our vision for implementing a feasible, COBRT-led communications strategy to educate Coloradans on the need for better career pathways to in-demand jobs through the use of College Measures webtool is a vision which unites our existing initiatives as well as future strategic goals. The webtool is available right now, and we encourage all of our members to check it out whether from the perspective of employers, parents, job-seekers or life-long learners. Please remember that being pioneers in this effort also means that we will be the first to discover if certain improvements need to be made. If you have any specific feedback, be sure to use this form to inform the developers. Be sure to tune in on Tuesday, June 14, 2016 from 4-5 p.m. at 1690 AM for COBRT’s Connect and Collaborate Radio, with Launch My Career Colorado’s lead researcher Mark Schneider as our special guest. (TALLAHASSEE, Fla.) –- Colorado Governor John Hickenlooper signed on May 27, 2016 HB 1289 into law establishing incentives for high schools to offer career and technical education opportunities to students in high-demand fields. Schools will be rewarded for each student who earns an industry-recognized credential. If funds allow, schools will also be rewarded if a student successfully completes an internship, residency, construction pre-apprenticeship, apprenticeship program or earns a qualifying score on an Advanced Placement Computer Science exam. HB 1289 was sponsored by House Majority Leader Crisanta Duran, Representative Daneya Esgar, Senator Leroy Garcia and Senator Larry Crowder. “Colorado has thousands of good, high-paying jobs that require applicants who are well educated and trained. By rewarding schools for students who earn an industry-recognized credential, and possibly for completing internships and apprenticeships as well, Colorado is creating opportunities for its students while laying the groundwork for a more competitive workforce in the future,” said Foundation for Excellence in Education (ExcelinEd) CEO Patricia Levesque. The bill establishes a $1 million annual appropriation that begins in fiscal year 2017-2018. The pilot will operate for 2 years and will be evaluated upon the conclusion for continuance. The participating school district or charter school will receive $1,000 per student in the program. Funding provided to schools is tiered and tied to performance. The first funding tier will be students who earn industry certifications in high-demand fields. The second funding tier, if there is remaining funding, will be for students who complete a qualified internship, residency, or construction pre-apprenticeship or apprenticeship program tied to high-demand fields. The third and final tier, if there is funding remaining, will be for students who earn a qualifying score on AP computer science. The Department of Education will be required to submit an annual report on program participation and performance. The Workforce Development Council, in collaboration with education and workforce agencies, will determine qualifying industry certifications, internships, residency programs, and construction apprenticeship and pre-apprenticeship programs based on job market demand. The Foundation for Excellence in Education is transforming education for the 21st century economy by working with lawmakers, policymakers, educators and parents to advance education reform across America. Learn more at ExcelinEd.org. 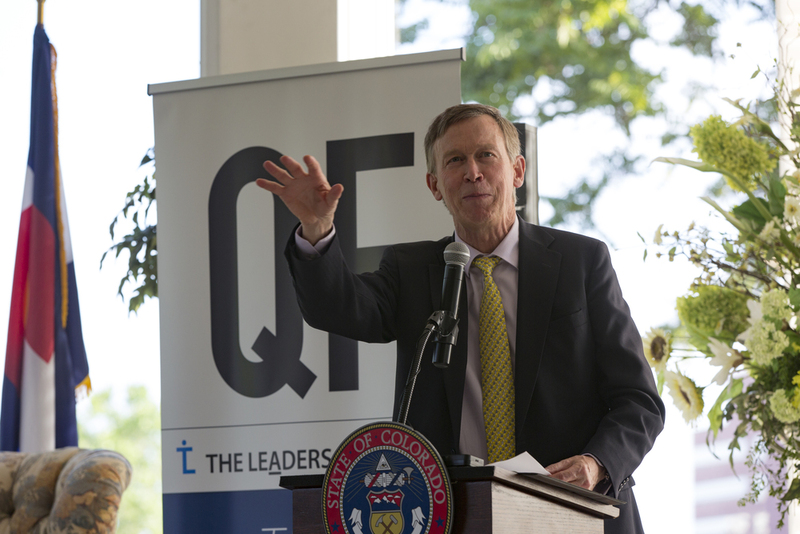 Quarterly Forum (QF) and The Leaders Initiative (TLI) announce the launch of the inaugural Colorado Governors Fellowship Program on June 29, 2016. TLI and its flagship Fellowship Program were inspired by Dr. Geoff Smart’s book, Leadocracy, and founded on the premise that government is only as good as who is in it. 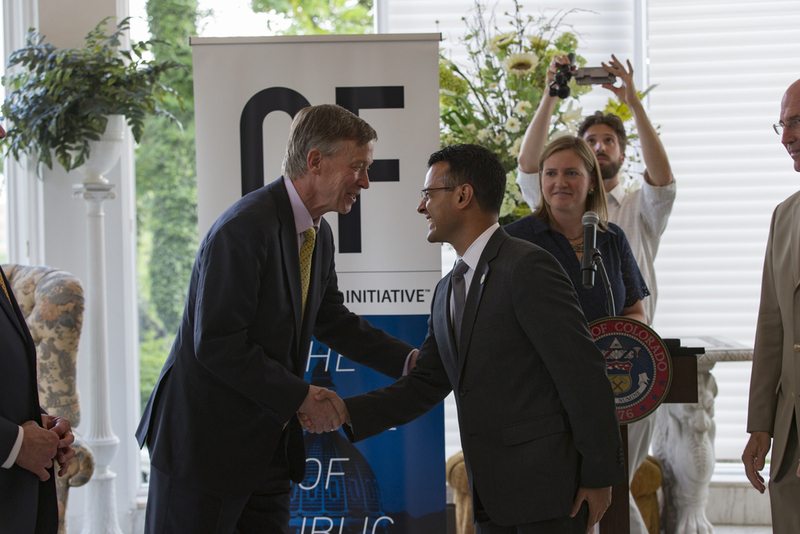 Through the bipartisan support of Governors Hickenlooper, Owens and Ritter, the Fellowship Program will engage private and nonprofit sector leaders in the future of public service and the advancement of our state. The Fellowship Program will prepare Fellows to contribute to solving the state’s most challenging issues while leading opportunities for growth and innovation. The Fellowship is an 8-month public policy program executed in partnership with the University of Colorado Denver School of Public Affairs and the Governor's Office, and supported by the Colorado Business Roundtable. Fellows experience a three-fold curriculum of education, exposure and experience through monthly sessions at The Commons on Champa, lunches with the Governor, shadow sessions with state officials and dynamic conversations with renowned speakers. The Program culminates with the Civic Intensathon, modeled after tech sector hackathons, whereby Fellows will apply their newfound knowledge to a real-time policy challenge and present their findings to the Governor and his senior administrative team. Fellows will graduate from the Governors Fellowship Program with new knowledge, relationships within the public sector and an alumni network of highly influential civic leaders who can make tangible impacts on the future of our state as highly-engaged executives, future senior-level government leaders or Governor-appointed committee members. General Counsel, Level 3 Foundation, Inc.
Senior Corporate Counsel, Level 3 Communications, Inc.
Chief Compliance Officer, DaVita Healthcare Partners, Inc.
Director of Recruiting, Arrow Electronics, Inc. Established in 2011, The Leaders Initiative (TLI) is a nonprofit professional association whose original mission was to elevate humanity by identifying, developing and deploying society's greatest leaders into government. 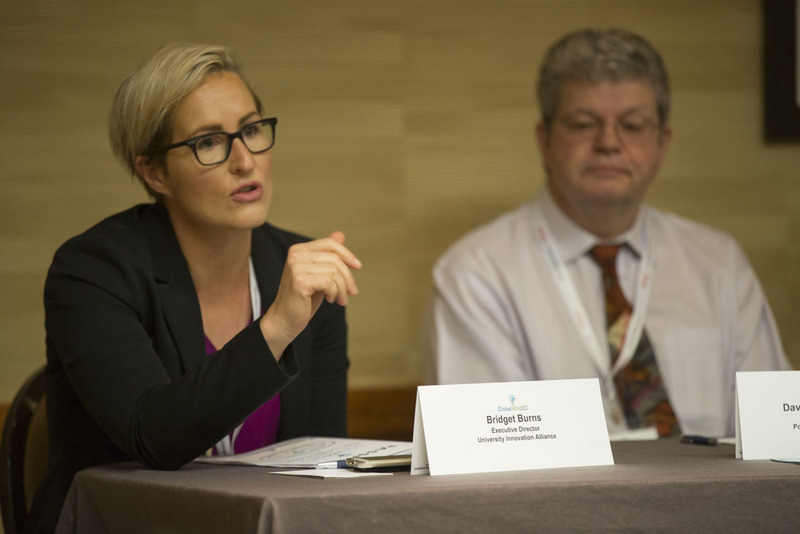 Since TLI’s inception, private sector leaders have worked with state government to curate a pool of talented potential cabinet leaders and institutionalize the connection between state government leaders and the business community. TLI works at the intersection of the public, private and nonprofit communities to engage leaders in applying their skills across sectors. Inspired by Dr. Geoff Smart’s book, Leadocracy, TLI was formed to execute programs on the premise that government is only as good as who is in it. In 2015, TLI merged with QF to scale the organization and focus more heavily on long­-term talent development within the government sector. As part of this transition, Colorado governors Hickenlooper, Owens and Ritter advised Quarterly Forum to strengthen program design and sharpen its non-partisan mission and programmatic focus. The cornerstone of the TLI program is the Colorado Governors Fellowship Program, an 8-month program that engages business and nonprofit leaders into Colorado public policy while elevating the opportunity to make an impact by serving in government. It is an honor and privilege to announce the 20 extraordinary leaders who have been selected for the Latino Leadership Institute Fellowship. The Summer 2016 Cohort, who average 14 years of professional experience, represents an accomplished group of professionals across the private, public, non-profit, and education sectors in Colorado.